Nicholas went around the house gathering all the money he could find. He placed it in a big pile and said “Mine” repeatedly. This is the look on his face when I caught him! Seriously, this was some cash a client had me bring to a home show to use as part of a marketing event. 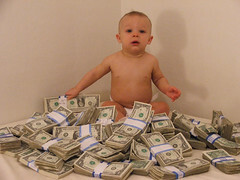 I just couldn’t resist taking some photos of the baby in a big pile of cash, even if it was all singles . . .